Nice! 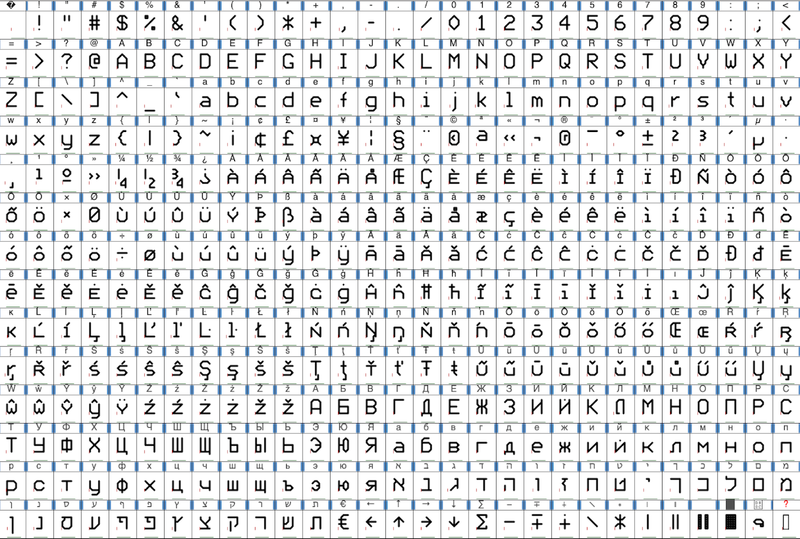 It's a shame there's not full coverage in Unicode for all the teletext characters as your code would be ideal for creating the full set. Indeed, easy to add if we could find a suitable place for them in unicode. Ooh, it looks like you've independently invented something very like my SAA5050-derived font, Bedstead. I haven't yet release Bedstead Plotter (which is very like your FiveByNineJTD family) but I did embroider it. I took the other approach to joins like the one in 'R': mine look like the ones generated by a real SAA5050 even though that's a bit odd. If you want to add the teletext mosaic graphics characters, please choose the same encoding in the Private Use Area that someone has already used! I think I know of three or four different encodings for them now, and it would be nice to avoid even more. 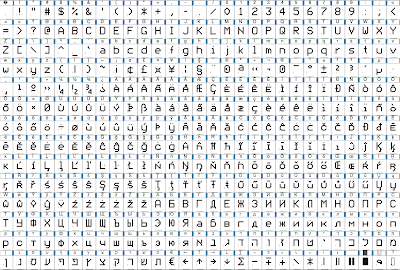 Bedstead's glyphs are essentially in the public domain one way or another, so if you want Cyrillic, Greek, Hebrew, or IPA, you could steal Bedstead's bitmaps. That is very much more like what I coded in 1981 on a BBC micro, and yes I had the same issue with the R back then and left it like that. To make accented characters I had to do something slightly better though, hence the two pass approach now. Ah, and you went further to do proportional spacing, which I also did back in 1981, but have yet to do on this font. Yeah, the accents in Bedstead Plotter are pretty ugly when they touch the base letter. I decided that was an acceptable price for the principle of generating everything from the bitmap. You guys were writing your own proportional spacing fonts in 1981?? I couldn't even spell my name back then. Heck, the first computer I used was a Spectrum and I didn't even know proportional spacing fonts were a thing back then! You guys take "leet" to the next level. These fonts look excellent! People seem to forget that the key function of a font is readability, and these great fonts have it in spades. I saw a TV show about the lady who designed the font used in UK road signs and apparently she made a fortune from it. A good font makes a better world. Yes, Elite was a very good game. I remember that, once you made a certain amount of money, thereafter it was very easy to keep on raking it in. I think I used to use the mining lasers on the way to Mars to bounty hunt, which made me my first small fortune in the game. Do you also remember the hidden messages in the startup sequence batch files of Commodore Amiga games? I remember one game, Turbo Outrun I think it was, which had a 1000 word essay to wannabe pirates, telling them all about their "copulation" habits and insulting them in other ways. I remember having to look that word up at the time (please note, I never pirated any software, mine was an original copy and I just opened the file out of curiousity). Weren't those different times hey. Back then you could get a whole game in just a few hundred kilobytes. In fact, some of the best demo software was written in assembler and was literally less than a kilobyte (compressed) and they had all sorts of lovely 'chip tune' music and graphics. Nowadays even things like HP inkjet drivers can be a couple of Gig.